This is probably the most delicate post I’ve written so far on Mandi’s Making. Unless you’re Kotex or Carefree, or trying to fob off a thrush treatment on TV, ‘lady stuff’ is not really considered a polite conversation topic. So, I’m just letting you blokes know that this is going to be a ‘ladies-only’ post, so don’t blame me for getting squeamish later. 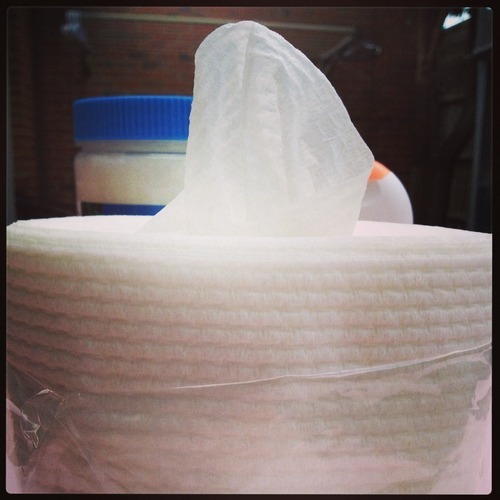 This is your cue to leave :-D.
Ladies, as you could most likely deduce from the title, this is post is all about making your own fem-wipes, and as always, saving $$! The last packet of fem-wipes I bought from the shops I got for my hospital bag for when I was going to have Miss G. I figured it would help me out with bathroom breaks in the first couple of days after giving birth. I delivered naturally, and they did help when I felt a bit delicate. Fast forward a few months, the 20pk of wipes slowly dwindled through *ahem* normal lady cleaning usage until they were all used up. They’re handy to have around, especially in your handbag (how many times have you been in a public toilet only to find no loo paper? ), so I wanted to buy another packet. Cue dramatic music; $6.50 for 20 sheets for the brand I usually buy!! Some brands differed in quantities and prices, but it was $0.33-$0.43 per sheet! That’s crazy! And I used to complain about the price of baby wipes, and they’re only $0.04 a sheet! You know by now I love my wipes, so I had to give the lady wipe the Mandi’s Making Makeover. 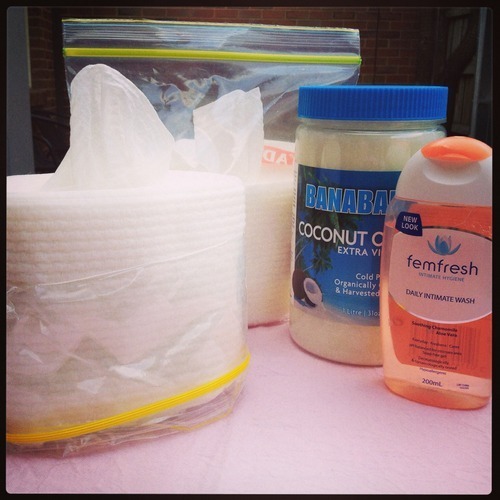 I already buy feminine wash, so I decided to adjust the Face Wipes recipe to use that instead of the baby wash. 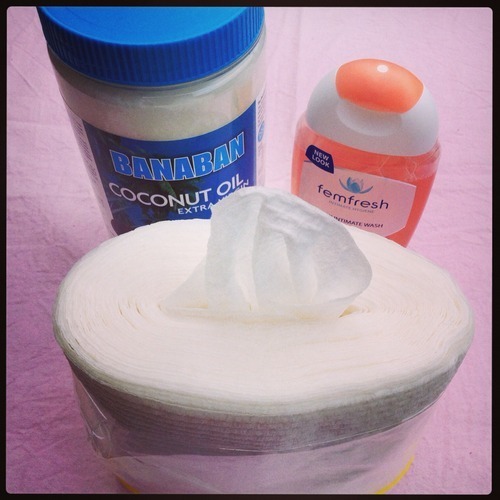 This is even simpler than the face wipes, it’s just coconut oil, feminine wash and warm boiled water. Nice and simple, and it’s stuff that I already use and am comfortable using on my body. Also, 1 bag of my version only costs approximately $1.20*!, That’s over $5 less than the commercial brand I used to use! This recipe is a half batch compared to the Face Wipes and the Baby Wipes, and I’ve made them in a ziplock plastic bag for 2 reasons. 1) I don’t use them as often as the other wipes, and 2) for portability. I could pop these into my suitcase or handbag and take them with me if I needed them, right next to the giant block of Lindt 70%… as a matter of fact, you could make tiny purse packs, just unravel the half of paper towel, divide it into 3 sections so there’s 20 sheets in each length, accordion fold it then place each bundle in a snack size ziplock bag and pour 1/3 of the solution in each bag. In a small measuring jug, whisk together the coconut oil and feminine wash until it looks like white shampoo. Top it up with the boiled water to the 200mL line, then whisk to combine. Place paper towel upright in the bag cut side down, then slowly pour half of the wipe solution over the paper towel. Allow the solution to soak in. This can take some time, I usually do this over 30 minutes to 1 hour. Gradually add more solution until it’s all poured onto the paper towel. Once the paper towel has absorbed all the solution, pull out the cardboard tubing from the centre and pull out the first sheet. Seal bag shut and you’re done! Notes: When cutting the paper towel, cut it straight across the middle with a bread knife or a saw so you’re left with 2 toilet roll sized paper towels. Be careful and use a chopping board if need be. *My pricing is based on when I buy my products. For instance, I only buy Viva paper towel when it is $1 per roll or less, so the pricing reflects that. Different brands have different prices, and sometimes they go on special. This price is based on $0.50 of paper towel and feminine wash, ziplock bags and coconut oil at their standard prices. Previous Post Cleaning Your Shower Without Shower Cleaner – And Saving Money!